On a cold, wet November morning, veterinary technician Julie Lemon is lying on her stomach on a hard floor. Angling her head, she carefully positions a small metal wand between the hard, pointy toes of a tapir, who’s anesthetized and sleeping soundly in his den. Then she presses a button, and a stream of pink light floods the inside of the hoof. Magic? No – but the effects can be just as marvelous. It’s laser therapy, and Lemon’s morning work with Baku the tapir is just a part of a veterinary care program at Point Defiance Zoo & Aquarium that brings new treatments like this healing, light-based therapy to an astonishing variety of animals. Veterinary technician Julie Lemon applies laser therapy to Baku the tapir. On the floor is the Spectravet monitoring device, which helps her measure frequency and duration of the laser. Light therapy isn’t a new thing – at least for humans. In 1903 Dr. Nils Finsen won a Nobel Prize for treating diseases with concentrated light radiation, and since the first red ruby laser was built in 1967 scientists and doctors have worked to see how it applies to healing. Current low-level laser therapy uses a low-powered beam (10mW – 500mW) in the red to near-infrared spectrum, which can penetrate skin and tissue. It’s been proven to reduce inflammation, relieve pain and speed tissue repair, with the light triggering biochemical changes in damaged cells in a similar way to photosynthesis in plants. It stimulates endorphins and lymphatic flow, flushing out inflammation and increasing healthy cell division – all good things for healing. Laser therapy is particularly good for muscle pain, skin or tissue damage and arthritis – which is why it’s become a part of animal care for many veterinarians. At Point Defiance Zoo & Aquarium the veterinary team has been using it for just over a year now, with Lemon treating a surprising variety of animals: elephant, penguin, tapir, pancake tortoise, goat, porcupine, small-clawed otter, even fish. 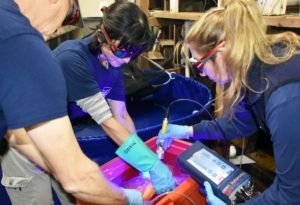 Veterinary technician Julie Lemon gives laser therapy to a rockfish, assisted by aquarium staff. The rockfish in question had been anesthetized for the procedure, to prevent it from splashing and allow Lemon to more effectively target the lesion. Animals like Baku can get laser treatment without anesthetic, but routine exams also offer a good opportunity, after the care team trims and clips hoofs, checks eyes and mouth, gives vaccines, takes routine blood samples and generally gets a good look at the animal’s body to make sure it’s healthy. Other animals, however, can be awake during the treatment – and seem to enjoy it. 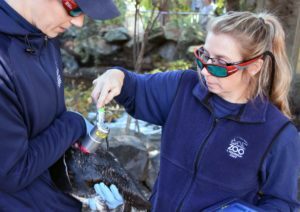 Even a turkey vulture brought on a veterinary visit from sister zoo Northwest Trek had the chance of some laser therapy. Julie Lemon gives laser therapy to a penguin, held by staff biologist Caryn Carter. 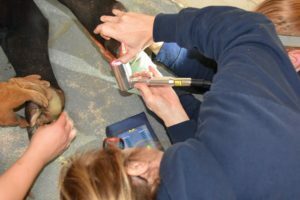 Down on the floor, Lemon is checking the monitoring device – a Spectravet – as she applies the beam to the sore parts of Baku’s hoofs. Armed with protective glasses, she spends 40 seconds on each part, with the device showing both frequency and duration. She also has different types of probes (the wand part), for different widths of light from precise to broad, and can even direct the beam at lymph nodes to stimulate the animal’s immune system for overall healing. “It helps revitalize the cells and wake them up,” she explains. On average, Lemon will treat her patients once or twice a week for several months, or until the wound or injury clears up. Right now, Baku is at the end of his session, and as Lemon, the keepers and veterinarian Dr. Kadie Anderson pack up their equipment there’s a sense of quiet satisfaction.